Prevost Diecast Replica Model Buses - 1:64 scale model bus replicas of Prevost XLII Conversion Shell and X3 Passenger Coach Buses Prevost Diecast Replica Model Buses - 1:64 scale model bus replicas of Prevost XLII Conversion Shell and X3 Passenger Coach Buses. 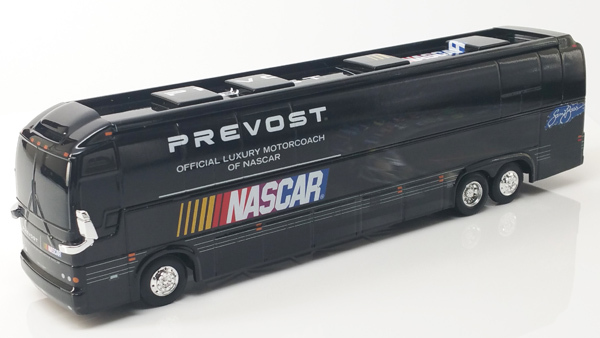 Prevost is proud to offer the “Official Prevost Die Cast Replica Bus” program. This program features 1:64 scale, limited edition replica versions of the Prevost XLII and H Series VIP Conversion Shells, as well as X3 & H Passenger Coach buses. These eight inch diecast model buses are painstakingly detailed, scaled to perfection, and reflect the quality expected of the Prevost brand. Each diecast replica bus commissioned will be a limited edition production run and documented as part of a Prevost-only collector’s series. Once a production run is sold out, there will never be any additional buses produced, making the models instant collector’s items.